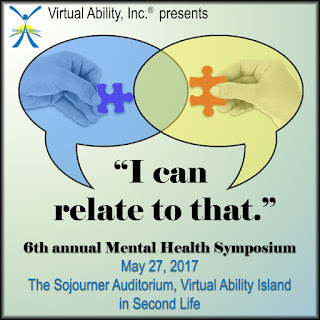 The Virtual Ability community in Second Life invites you to join us for our sixth annual Mental Health Symposium. It will be held on Saturday, May 27, beginning at 6am Pacific (9am Eastern), and continuing through 5:30pm Pacific (8:30pm Eastern). There is no charge to attend. The theme of this year’s Symposium is “I can relate to that.” Our international group of presenters offers a wide interpretation of the theme, based on their interests and academic backgrounds. Attendees will learn ways to promote mental health for themselves and their families, how diet affects mental health, and how first responders and medical clinicians can improve their own mental health. The Virtual Ability community hosts this annual Symposium to share information about mental health and mental disabilities with the general population. Within our cross-disability community we have members who deal with a variety of mental health issues. Not only is this an opportunity for our community members to learn more about topics related to mental health from experts they probably would not have a chance to meet otherwise, it is allows the general public to attend a professional conference for free. Namaara MacMoragh "Mental Health Following Brain Injury"
Please contact info@virtualability.org for additional information.